Thomas Langescheid got in contact with Tchoukball whilst his activities in the board of the club TuS Oeckinghausen and the ‘Association of Sports Clubs in the city of Halver’. In these positions he accompanied and promoted Tchoukball in Halver. 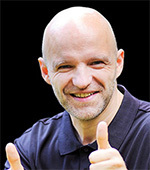 Thomas is President of DTBV (German Tchoukball Federation) since October 2012, after the death of the first DTBV President Karin de Laporte in May 2012. He is a mechanical engineer and specialized in engineering design. Joachim Fromm is a journalist, worked as an editor for newspapers and radio. Today he is a project manager for small as well as large, highly complex digital projects. As a teenager, Joachim played volleyball and handball and went canoeing in a club. For Tchoukball he came about his son, who had learned the sport in a voluntary additional offer in the school. Joachim plays in a purely recreational sports team of his Club SG Urbich and is a board member of the German Tchoukball Federation and the Tchoukball Federation of Thuringia. In this interview, Thomas and Joachim explain to us how Tchoukball has been developing in Germany, the organization of the 2014 European Tchoukball Championship, the number of staff, and why they wanted to organize this event. They also explain what are the obstacles to promote the game in Germany. Chris Huang of Taiwan, FITB President. Chris Huang is a physical education teacher, and leaves in Kaoshiung Taiwan . Discovering the game while in college, Chris did a master and his memoir was on Tchoukball history in Taiwan. Chris is also the president of the International Federation of Tchoukball (FITB). Chris is a n enthusiast supporter of the game, and he is spending time, energy and money to promote Tchoukball around the world. In this interview, Chris explains how he discovered the game, what are his motivations to promote the game, as well as his goals as the president of the FITB. In this interview, Chris answers in Chinese and translation is made by Victor Wang, thank you Victor.